Step 7 of the 12 steps states, “We humbly asked Him to remove our shortcomings.” But what does this step entail and why is it important to practice it? Call 800-653-7143 now to find rehab centers where you can recover safely from addiction and begin your journey through the 12-step process. What Does Step 7 Mean? Step 7 occurs directly after step 6 where the individual must become “entirely ready to have God remove all [their] defects of character” that relate to their wrongdoings in the past. Once you are ready to ask for these defects to be removed, you must do so in a humble and gracious manner. This is a difficult step for many individuals, especially those who are not particularly religious, but it can still be practiced in whatever way makes you the most comfortable. Do I Need to Believe in God to Achieve Step 7? 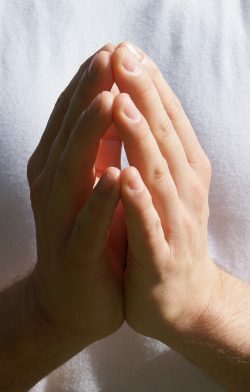 Prayer is a popular way to communicate with one’s higher power. No. God can stand for anything that you are able to view as a power higher than yourself. This is why, as stated by the Substance Abuse and Mental Health Services Administration, it is sometimes described as a “helping power” instead to remove any necessity for religious symbolism. Your power can be humanity as a whole, the universe, music, the support group itself, or another strong force that you feel will be able to help guide you through your journey. Why Do I Have to Ask for These Shortcomings to Be Removed? This is part of the 12-step process, and it is important to understand why you cannot remove these shortcomings on your own. According to the National Institute on Drug Abuse, two of the most important ideas in the 12-step program are acceptance and surrender. Acceptance occurs when one realizes that “willpower alone is insufficient to overcome” the issue of substance abuse and that abstinence is the only way to do so. Because one is not usually able to achieve abstinence solely on their own as a result of their addiction, they will need the help of a higher power. Surrender occurs when one realizes they require this higher power’s help as well as the help of others to recover and to stay sober. Once you ask that these shortcomings be removed, you will be able to get in tune with your higher power, realize your own willpower is not the strongest asset available to you, and start to make a change that will allow you to focus on the future. Prayer and meditation are some of the best methods of communicating with your higher power and becoming more in tune with yourself. By practicing these acts, you can start to make a change in the way you see yourself and the way you feel toward your addiction and the other forces around you. You can also ask your fellow 12-step group members how they achieved step 7. If you are utilizing the 12-step process to recover from addiction, make sure to stay on track and to continue attending meetings. It can also be very helpful to attend professional treatment, and both can be done simultaneously. Call 800-653-7143 now to find rehab centers that will cater to your needs.